Living in Houston I’ve learned that Texans LOVE spicy, hot food. They serve everything with a side of Tabasco or hot salsa that makes your forehead sweat, and it’s already hot enough without the spicy food. Eggs, steak, salads, burgers… everything is bursting with heat. I spent my first few months in Houston downing gallons of milk every time I attempted to conquer the red salsa at our local Mexican restaurant. Sadly, I never succeeded. But in an effort to enbrace my new home I’ve tried to incorporate some spice into my classic recipes to satisfy my friends cravings. The thing I like about these cookies is that they don’t immediately smack you in the face with heat, it gradually hits at the end and lingers ever so slightly. I didn’t want to mess with a classic too much, but I do think this takes a traditional oatmeal cookie to a more grown up level. 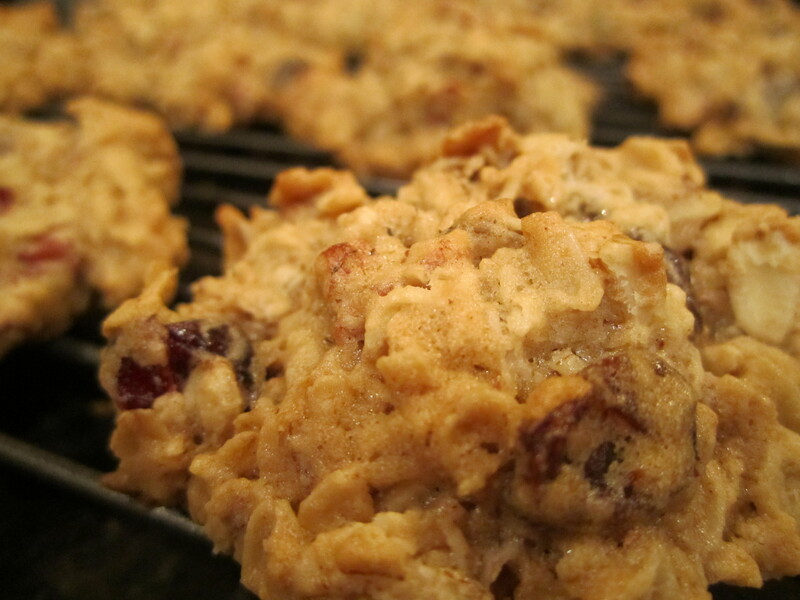 The cranberries add to the chewy texture of the oats and give it an added sweetness needed with the earthy spices. I purposely left out cinnamon, usually a staple in oatmeal cookies, as I didn’t want it to mask the other spices. The secret ingredient in these cookies is grains of paradise, a spice native to West Africa. I crushed the grains with my mortar and pestle which released the most heavenly aroma — a combination of black pepper, cardamom, coriander and citrus with a lingering scent of something floral and woodsy. If you crack one between your teeth, the flavor follows in much the same order as the aroma. If you only get one thing from this recipe I hope it’s an introduction to this wonderful spice. The floral, peppery flavor is going to make a wonderful addition to just about all your favorite foods. Your grilled steaks, fish, vegetables and potatoes will thank you. If you’re looking for something a little more special, pop two cookies in the oven at 350 for a few minutes and add a scoop of vanilla ice cream and you have a perfect ice cream sandwich. Place nuts in a small pan and toast on medium heat for 5-7 minutes. As soon as they become fragrant take them off the heat and space them on the side to cool. In a medium bowl, mix together flour, baking soda, nutmeg, cayenne, grains of paradise and salt thoroughly and set aside. In a large bowl, beat butter, white and brown sugar, and vanilla until the mixture changes color and becomes a smooth, pale white… this is what you want so you have light, fluffy cookies. Slowly add the flour mixture and continue to stir with a wooden spoon until well incorporated. Add oats, pecans and cranberries and stir until mixed well. Scoop dough on to ungreased cookie sheets, I use a mini ice cream scoop to make it easier. I also spray the spoon with pam so the dough doesn’t stick. Let the cookies cool on pan for 1 minute before placing on wire rack. Ok, I waited long enough. It’s now officially holiday season with Thanksgiving only 10 days away! I’ll continue to post some healthy alternatives to get you through the cookie season, but this is not one of them. This is melt-in-your-mouth, buttery, sugary heaven, and a perfect way to begin the festivities. 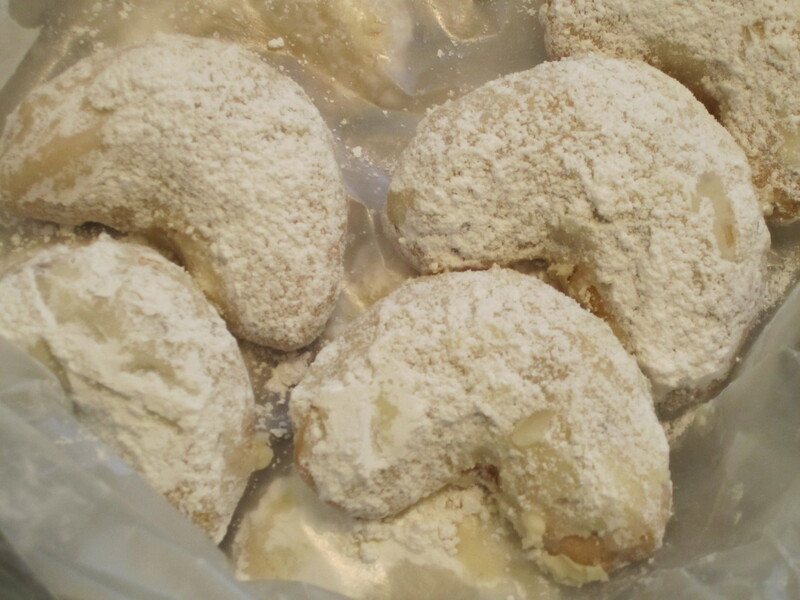 These quick, easy powdered sugar-covered shortbread cookies are known as Russian tea cakes or Mexican wedding cookies. Either way they’re delicious, and dead easy to make. They’re very similar to a shortbread cookie, but have the added flavor and texture of pecans and the silkiness of powdered sugar. The secret to great tasting Mexican Wedding cookies is to use a high quality butter and pure vanilla extract. Yep, it’s that simple. 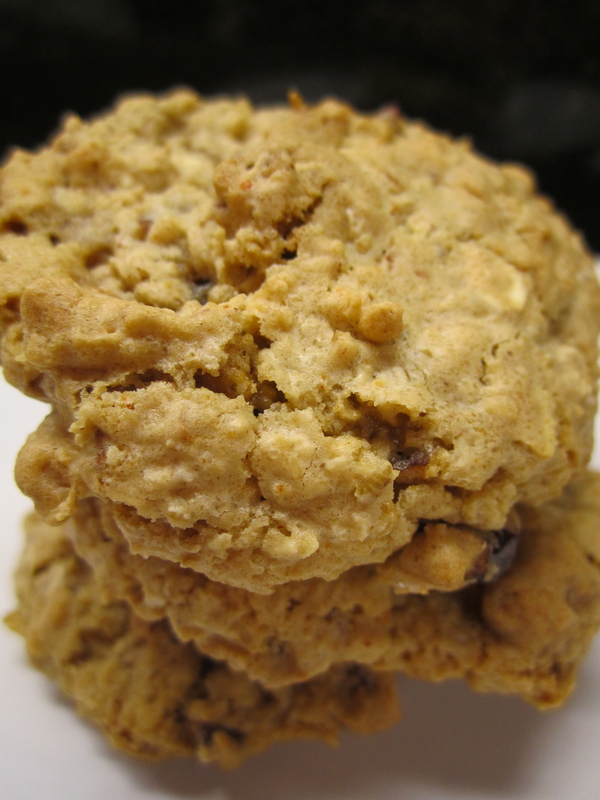 The distinctive quality of these cookies that make it stand out from others is the smooth, velvety texture, light as air yet buttery flavor, and the surprising hint of crunchy nut which elevates this from simple cookie to a grown-up confection. I remember being horribly disappointed by these cookies as a kid because they aren’t overly sweet. Now I appreciate that subtle sweetness and complex nutty flavor. Cream the butter and sugar in an electric mixer at low-speed until it’s smooth and light in color. Beat in vanilla, almond extract and nutmeg at low-speed. Keep mixer on low and gradually add the flour. Once you add all the flour, remove mixer from stand and mix in the pecans with a spatula. With floured hands, take out about 1 tablespoon of dough and shape into a crescent. Continue to dust hands with flour as you make more cookies. Place crescent shapes prepared cookie sheets. * QUICK TIP: If you’re short on time, you can raise the oven temperature to 350 and cook for 12-14 minutes per batch. I prefer the slow cooking method, it keeps them evenly cooked and you have less chance of overcooking them, but the hotter oven also works. Buying vanilla extract can be a challenge as there are so many choices. The first thing to do is to make sure that it’s labeled “pure” and not “imitation”. The best I have found, although it is quite expensive, is Nielsen-Massey Madagascar Bourbon Pure Vanilla Extract that can be found in specialty food stores and online. I’m not one to go for the fat-free, low-carb, no flavor recipes. I like everything in moderation and this is a good recipe for those who want to meet in the middle, a little bit on indulgence without all the guilt. 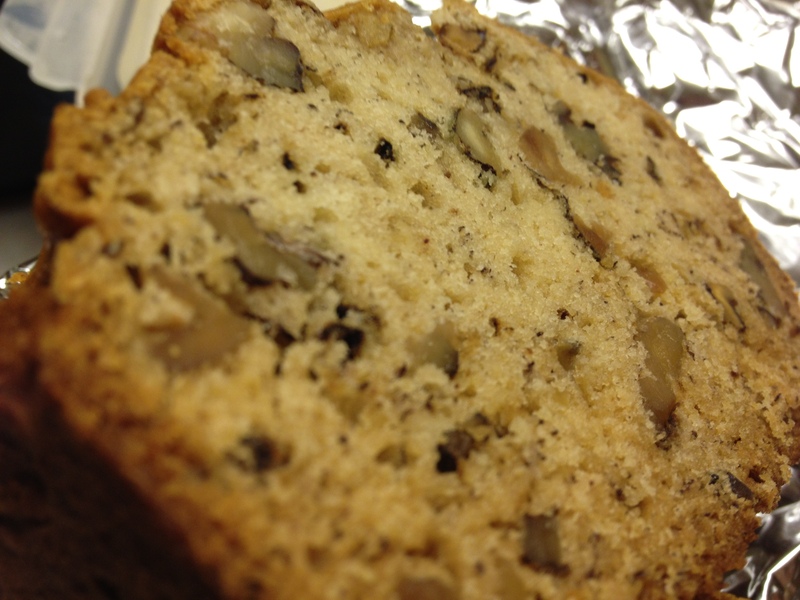 This recipe usually calls for a stick of butter, but I decided to substitute in some other ingredients to give it the same moist consistency you’re looking for in traditional banana bread. I’ve made more banana bread than I like to think about trying to perfect this combination, and I’ve finally found one that’s a winner. I’m not a huge fan of bananas, but there’s something about the smell of warm nuts and toasty bread in the oven that warms my heart and has me waiting by the oven to dig in. Spread a thin layer of honey or jam on top and settle in for some much-needed deliciousness. When oven is ready, toast the nuts for 10 mins. Remove and set aside to cool. Lightly grease a 9×5 inch loaf pan. In a large bowl, combine flour, baking soda, nutmeg, cinnamon and salt. In a separate bowl, mix melted butter, yogurt, applesauce and mashed bananas, and vanilla. Then add 2 eggs and mix until well blended with a whisk. Gently stir banana mixture into flour mixture; do this quickly and only until the mixture is moist, if you over mix you will end up with rock hard banana bread. Bake for 50~60 minutes, until a toothpick inserted into center of the loaf comes out clean. This bread lasts for about a week if you keep it in a Ziploc bag in the fridge. I like to toast the slices after the first day and spread honey and butter on the top. It’s also been known to be a good companion to your cup of coffee on those early Monday mornings.